Puntos Necesarios: 9800 Tenga en cuenta que, de momento, no se puede descargar contenido de nuestra plataforma directamente en un dispositivo móvil (teléfono, iPod, iPad, tabletas ...). Necesitas descargar sus artículos en un PC o Mac y, a continuación, transferirlos a su dispositivo de forma normal. Estamos trabajando para permitir que las descargas directas a los dispositivos móviles, pero esto no es posible en la versión actual de la plataforma. Perdón por las molestias! NOTICE: Activation key must be used on a valid Steam account, requires internet connection. ABOUT THE GAME	The Fernbus Coach Simulator is the first simulation of the very popular intercity buses. 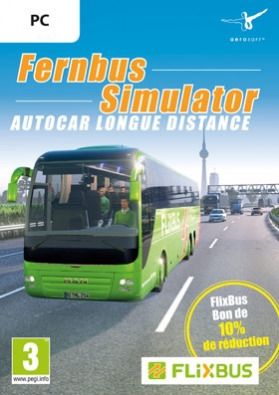 Thanks to the cooperation with FlixBus the Fernbus Coach simulator shows the daily life of a coach driver on the German Autobahn, highways and in more than 40 cities in great detail. With a large and m… odern MAN Lion’s Coach Bus you experience the daily life of a long distance coach driver. Navigate through a complex Autobahn and road network to bus stations in the more than 40 implemented cities and stay in constant communication with the headquarters. Be careful with the other car traffic during your trips on partially full German highways and control your bus safely by day and night during all seasons. About 20.000 km of the German route network of FlixBus and over 40 cities were simulated. Time passes at a scale of 1:10, so that the individual tours last not too long. Like in reality at the bus stations passengers already holding a valid ticket can get on right away while the other passengers have to buy a ticket from you. Both MAN busses are equipped with original cockpits including all functions. The interior and exterior of the bus is modeled to the last detail. True to original passenger announcements provide a realistic atmosphere. Construction sites, traffic jams and accidents will challenge you as a bus driver to keep up with the schedule. The busses were tested and optimized by bus drivers and driving instructors. KEY FEATURES In cooperation with Flixbus Original MAN Lion's Coach und Lion's Coach C 2000 km of track, corresponds to a real route length of 20,000 kilometres Detailed bus cockpit with extensive functions Complex Autobahn and road network on 5000 m² of surface Dynamic weather with four seasons More than 40 German cities, including: Berlin Hamburg Munich Cologne Frankfurt Stuttgart Leipzig Dresden Erfurt Würzburg Karlsruhe Bremen Hannover Dusseldorf Dortmund	Driving by night Bus driver is able to leave the bus Extensive evaluation tool True to original passenger announcements Traffic jams, accidents and construction sites Ticket sales by the driver Free play mode Repaints First add-on already in developmentSYSTEM REQUIREMENTS Minimum: OS: 7/8/8.1/10 (64bit only) Processor: Intel Core i5 Processor or similar with at least 2.6 GHz Memory: 6 GB RAM Graphics: Nvidia GeForce GTX 560 or similar AMD Radeon (no support for onboard cards) DirectX: Version 11 Storage: 45 GB available space Sound Card: Yes © 2016 AEROSOFT. All rights reserved. All trademarks and brand names are trademarks or registered trademarks of the respective owners. Copyrights are serious stuff. If you find any pirated copies of this software please notify us at support@aerosoft.com. We will make sure reports of copyrights violation are rewarded.